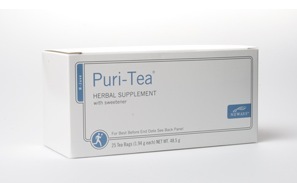 Neways Puri-Tea is formulated to specifically support natural colon care. Gastrointestinal health ultimately contributes to overall health and wellbeing. As the gastrointestinal tract is supported and cared for, it plays an important role in digestion, thus promoting healthy bodily function. However, many people have irregular bowel movements, and a lacklustre bowel function can be detrimental to overall gastrointestinal condition. • Hibiscus Flower - consumed around the world and contains significant levels of phytonutrients which provide gentle digestive support in addition to a pleasing flavour and aroma. • Papaya Leaf - Papaya Leaf contains an enzyme called papain which helps breakdown proteins and carbohydrates. Traditional consumption has centered around the digestive health and support of regularity. Please always read the product label. Senna Leaf, Buckthorn Frangula, Hibiscus Flower, Papaya Leaf, Chamomile Flower, Ginger Root, Red Raspberry Leaf, Fennel Seed, Lemon Grass, Peppermint Leaf, Orange Peel, Sucralose.